The Rev. Philip Wainwright has recently posted an article on “Biblical Reasons for Staying” in The Episcopal Church (http://parishtoolbox.org/index.php/tbx/entry/40). As a fellow priest of the Diocese of Pittsburgh who has written on the issue of church discipline, particularly in our current Anglican crisis (see various essays at http://www.stephenswitness.com/), I shall venture a brief reply. First of all, let me appreciate the fact that Philip Wainwright is seeking God’s will from Scripture. That puts us on a common footing and, frankly, out of step with many of the leaders of the Episcopal Church today. Secondly, I am going to assume, although he does not say so directly, that Wainwright agrees with Lambeth Resolution 1.10 that “homosexual practice is contrary to Scripture” and that he agrees with Paul that those who persist in sexual immorality will not inherit the kingdom of God (1 Corinthians 6:9; Galatians 5:21; Ephesians 5:5). Jesus urges his disciples to be deliberate in approaching an erring brother, to avoid shaming him in public, if possible, and to make sure that any final judgement was shared by the wider community. So yes, the Christian is to be careful and patient in disciplining a brother, but there is a final word of exclusion: treat him as you would a pagan or a tax collector, which in the Jewish context means, shun him. Wainwright asserts without evidence that these words do not suggest separation from the church and its assembly and sacraments. I would argue, on the contrary, that given the specific reference of verse 17 to “tell it to the church,” it is precisely excommunication which Jesus has in mind. The apparent contradiction between Jesus’ command with his own practice of dining with publicans and sinners is resolved when one understands the second principle of church discipline, which has to do with levels of accountability. This principle is expressed succinctly by Paul to the Corinthians in the case of the man who was found sleeping with his mother-in-law. These two Scripture texts have been expounded at length and convincingly in an essay by Robert Gagnon of Pittsburgh Theological Seminary titled “Church Policy As Regards Homosexual Practice: Membership and Ordained Ministry” (see http://www.robgagnon.net). Dr. Gagnon concludes that these texts justify exclusion of openly practicing homosexuals. In my opinion, there is no difference between an openly practicing homosexual and a church leader or a church body openly advocating the practice (see Matthew 5:19). Quite possibly, the brother in Matthew 18 and the man 1 Corinthians 5 were simply lay Christians in the church. How much less then does Paul tolerate impenitent false teachers? (Again, I find hard to swallow Wainwright’s identification of Anglican bishops like Jack Spong as “babes in Christ” who need milk, not the rod.) Once again, Paul does not rush to judgment and assumes that godly leaders like Peter can be temporarily led astray and brought back with a firm rebuke. But this is not his attitude to the Judaizing teachers in Galatia, about whom he says: “Cast out the slave woman!” and “I wish they would emasculate themselves!” (Galatians 4:30; 5:12). Indeed, to say “let them be anathema” (Galatians 1:8-9) means, let them be delivered to divine wrath for destruction (anathema being the LXX translation of the Hebrew herem or sacred destruction). In Romans 9:3 it refers to being separated from Christ. In the Pastoral Epistles, which some attribute to the sub-apostolic period, one can find a similar “intolerant” attitude toward false teachers like Hymenaeus and Alexander, of whom Paul says “I have handed them over to Satan to be taught not to blaspheme” (1 Timothy 1:20; cf. Titus 3:10). First John is written so that the folks John addresses will remain in fellowship with God, with the truth, and with John himself as he is in fellowship with God (1 John 1.3). The antichrists were claiming to be Christians, but John says they have departed from the teachings of Christ (i.e., about Christ and His teachings about the Father) and thus have departed from God and the disciples should not have fellowship with them. I think this is the point of 2 John 9. The “progressives” have progressed right out of the faith. Now, I think when these teachings first arose in the community John remained in fellowship with the community members who were embracing the ideas as he sought to correct their error, but when they became clear in their error and settled in it, the fellowship was broken. At least this seems to be the way it worked for Paul, and I haven't seen anything in John to suggest this was not the basic pattern in his communities as well. In both cases the union with Christ is what determines the fellowship on the ground. The principle then would seem to be that there is a time for discussion and continued fellowship as new ideas are sorted out. But if someone comes up with a new idea that undercuts the foundation of the gospel, and they persist in this view and reject the apostolic teaching against their view, then there is separation. This is Paul's way of dealing with the opponents behind Galatians - he argues with the Galatians who are tempted, but he anathematizes the teachers who have embraced this false teaching and are promoting it. So also John with the antichrists -- they are worshipping false gods (1 John 5.21), they have sinned the sin unto death, apostasy (1 John 5.16-17). Now, how these principles worked out institutionally in the first century is not entirely clear, and our institutional structures are certainly more developed. But the principles remain. Finally – and I must say I find this strange coming from a former editor of the Episcopal Evangelical Journal – Philip Wainwright appears to undermine the legitimacy of the Protestant Reformers. Indeed he calls the Anglican Reformers’ appeal to Scripture wrong, because it does not accord with his reading. Fair enough if his exegesis is correct, but if so, it is hard not to conclude that those separated from Rome were schismatics and that their offspring should return to Mother Church posthaste. 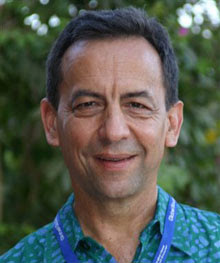 In the present Anglican Communion crisis, Philip Wainwright is stating a case like that made by the writers of the Anglican Communion Institute (see http://www.anglicaninstitute.org/). The ACI appears to include proponents of two views, one of which (Philip Turner) urges extended patience until the Windsor process has worked its way to the end, either after September 30 or after Lambeth 08. The other view (Ephraim Radner, if I understand him correctly) holds that in no circumstance is separation warranted. Wainwright seems to be in this camp. In the past, I have proposed the “Baal test” of loyalty: should one continue in a church which had substituted the name of Baal for that of Christ? I do not see from Philip Wainwright’s logic how he can extricate himself (and his flock) from the wildest deviations from the Christian faith and practice. And surely such deviations will come as the Episcopal Church continues on its pell-mell rush off the cliff. He ends with a counsel of quietism, waiting for God to act, presumably as He did with Ananias and Sapphira, or perhaps in the Last Judgment. Such quietism does not seem to have been the apostles’ practice, however strongly they looked for Christ’s Return. To those who say, “We must go to Lambeth next year, or else they will repeal or rewrite Resolution 1.10,” I say, by not enforcing the Resolution over the past ten years the Communion will have already repealed Resolution 1.10. To spend three weeks in nice Bible study groups and then go home is in effect to have the form of biblical godliness while denying its power. To which Paul adds: “Keep away from such places” (2 Timothy 3:5 my translation). For many Anglicans, September 30 is that moment when either the Communion through its Instruments will discipline the Episcopal Church – or blink. In conclusion, I find Wainwright’s position unsupported by Scripture, by the tradition of the early Church and the Reformation, and finally by common sense.